Can Essential Oils Help Fight Acne? Essential oils - the fragrant essences extracted from plants - have long been a staple of aromatherapy, but is it possible that they could help improve your acne as well? As you'll see, the answer to this question is not so clean-cut. It's true that they can be an effective supplement for your skincare routine, but there are also a few precautions to keep in mind when using them. Many of the commonly used essential oils have powerful antibacterial properties - including tea tree oil, lavender oil, and bergamot oil. Since breakouts partially occur because acne-causing bacteria become trapped inside our pores, you can see why these might be useful. Additionally, many other oils also have a drying effect on the skin, which is perfect for those who are constantly battling oily skin. Some popular choices for this include rosemary oil, geranium oil, and rose oil. The advantage to taking an essential oil-based approach to acne treatment is that many of these can be mixed and matched until they're tailored to your own unique skincare needs. So, for example, if you're looking for a treatment that is both antibacterial and has a drying effect, you might find success with a combination of the oils listed above. If you've been dealing with acne for any length of time, then you're already familiar with the burdens of sensitive skin. Unfortunately, when used carelessly, essential oils can make these skin sensitivity problems even worse. Since essential oils contain highly concentrated plant extracts, many times they're simply too powerful to be applied undiluted to the skin - and this is especially true for oils that are highly acidic or astringent, such as lemon tree oil or bergamot oil. When exposed to substances such as this, it's not uncommon to experience painful rashes, itching, and burning. So, in order to safely use them for a skincare regimen you will first need to dilute them with a "carrier" oil, which is used specifically for this purpose. Luckily, there are several skin-friendly options to choose from, such as grapeseed or olive oil. Both of these provide your skin with an array of nourishing nutrients and will protect you from the potency of essential oils. If possible, choose an organic carrier oil to ensure that the product you've chosen is really natural and not filled with additional chemicals. You might be surprised to learn just how little of an essential oil should be used when creating a mixture. Most experts recommend that essential oils comprise no more than 2% of your final concoction - which means you should use about 12 drops of essential oil for every ounce of carrier oil. However, if your skin is particularly sensitive, you may want to begin with as little as 1% (or 6 drops). While you may find success in treating current breakouts with essential oils, it's important to remember that they do not address the primary causes of acne. Because of this, it's best to think of them as a means of "damage control" and not a permanent solution to your acne problems. In order to truly be rid of your breakouts, you must focus on the unseen, internal origins of acne. For many people, the trouble starts with their hormones. When high levels of androgen are present in the bloodstream, it can send a message to your skin to begin producing more oil. This excess oil (also known as sebum) clogs your pores and allows acne-causing bacteria to flourish. Thankfully, products such as AcnEase have found a way to address this problem in a safe and natural way. 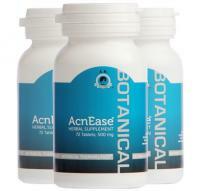 AcnEase is not a hormone replacement, and neither is it a way to manipulate your hormone levels - instead it prevents androgens from sending its signals to your skin with a proven blend of plants and other all-natural substances. So, while essential oils may be an effective and sweet-smelling way to reduce damage from breakouts, until you start to treat the primary causes of acne it's very likely that your problems will persist.